Blake Hagen has been writing since 2008. He holds a Bachelor of Science in exercise science with an emphasis in fitness and wellness management from Brigham Young University. He is also a certified health fitness specialist through the American College of Sports Medicine. Can Exercise Improve Kidney Function? Exercise is good for your mental health. Brisk exercise or aerobic workouts affect your body chemistry, promoting the release of feel-good hormones. Serotonin is one of those important brain chemicals that is linked to a happy mood and protection against certain emotional or mental disorders. According to Simon N. Young in "How to Increase Serotonin in the Human Brain Without Drugs," regular exercise is a key strategy to increase your serotonin levels. Aerobic exercise -- including walking, cycling, swimming and running -- can be as effective as antidepressant medications for mild to moderate depression and anxiety. 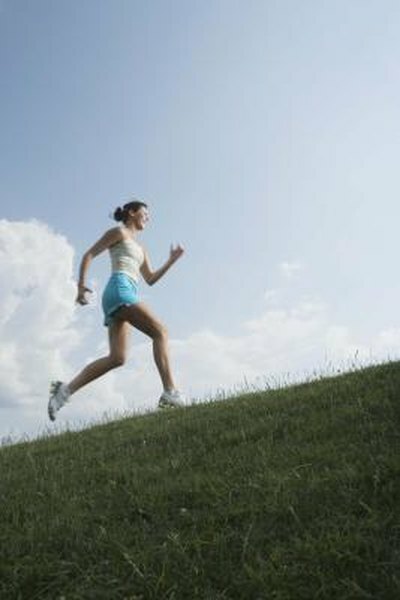 Regular aerobic exercise leads to the release of serotonin, dopamine and other endorphins. These brain chemicals help produce what is known as the “runner’s high,” or the positive mood and relaxation experienced after exercise. The University of Maryland Medical Center reports that 50 percent of older women with depression who are not responsive to drug therapy respond positively to exercise, experiencing mood improvement within 10 weeks. Strength training and other physical activities can also improve your mood by increasing serotonin and other brain chemicals. Strength training can include lifting weights, using resistance bands or doing exercises that use your body weight as resistance, such as pushups or pull ups. The American College of Sports Medicine recommends strength training for your major muscle groups at least two times each week to gain both the physical and mental benefits of muscle-strengthening exercises. Participating in 30 minutes of moderate-intensity exercise on five or more days each week can help you gain the physical and mental benefits associated with aerobic exercise. The University of Maryland Medical Center reports that even as little as 30 minutes of brisk exercise three times each week can relieve symptoms of mild depression. Menopausal women -- undergoing hormonal changes -- experience less anxiety and depression when they exercise regularly than their counterparts who do not exercise. Including regular aerobic exercise in your lifestyle can boost your serotonin level, increase your sense of well-being and get you through an experience that can be challenging for many women. Consult with your doctor before starting a new exercise program if you have been sedentary or if you have a condition that could make exercise unsafe for you. If you suffer from anxiety, depression or another mental or emotional disorder, follow your doctor’s instructions to help improve your condition. Including regular exercise in your treatment plan is a healthy coping strategy that can help you gain confidence and take your mind off of your worries. ACSM's Guidelines for Exercise Testing and Prescription; Walter R. Thompson, Ph. D.